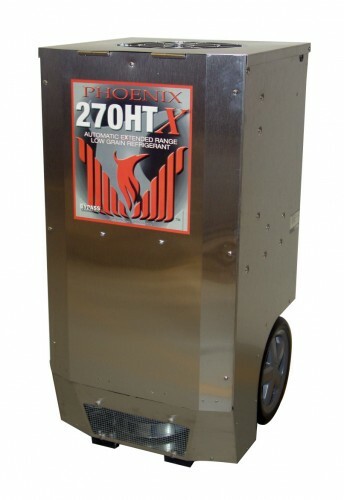 Automatic Bypass Technology for Maximum Water Removal The NEW Phoenix 270HTx removes 161 ppd@AHAM using 8.9 amps. With its patented bypass design, the 270HTx maximizes water removal over an extended operating range without any manual adjustments by sensing and adjusting to temperature changes in the drying chamber. 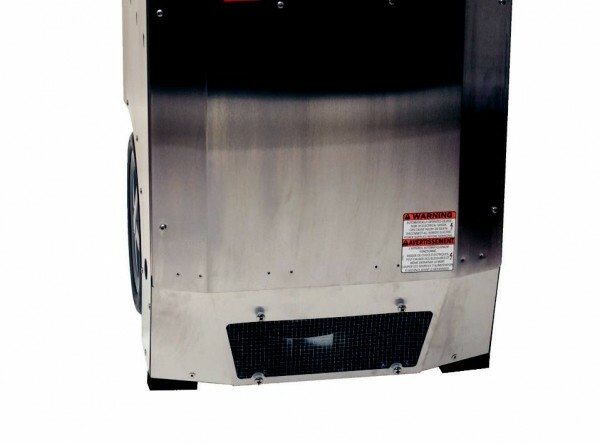 At higher temperatures, the 270HTx automatically adjusts causing faster evaporation rates, quicker drying, and eliminates the need to remove or modify equipment for temperature control. 8.9 Amps. 115 Volt/60Hz. 130 lbs. Product Features - Automatic Bypass Technology – Patented technology automatically adjusts for temperature variation, increasing performance over a wider operating range. - 8.9 amps - Removes over 6.5 pints/kWh. - More Grain Depression - Drier air from an LGR finishes jobs quicker versus a conventional refrigerant dehumidifier. - Focused Airflow - Patented focused outlet directs air downward across the wet surface. - Motorized Impeller - 380 CFM; Faster drying and superior static pressure for ducting. - Multiple Ducting Options - 12” intake, 10” exhaust. - Solid State Controls - Easy to read and operate. - Recessed 12” Wheels - Allows greater maneuverability on the job site and efficient storage. Rolls over obstacles with ease.